Turkey’s Justice and Development Party (or AKP) was the first national political player to engage the country’s Kurdish minority in a peace process, actively negotiating with the PKK (or the Kurdish Workers’ Party) and its imprisoned leader Abdullah Öcalan. But now this process has ground to a halt and the might of Turkey’s Armed Forces (or TSK) is crushing down on the Kurdish-populated south-eastern section of Anatolia. But could there be more than meets the eye in this and might there lurk a commercial incentive behind the ongoing conflict and Ankara’s policy of collective punishment??? 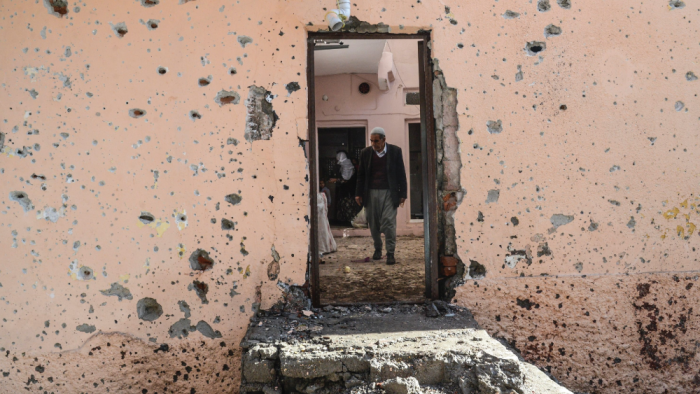 The Turkish-state-as-led-by-the-AKP has been waging all-out war against the PKK ever since the June elections proved unable to produce the desired outcome. In fact, the hostilities began on 24-25 July 2015 when Turkey’s Armed Forces (TSK) undertook Operation Martyr Yalçın aimed at PKK and ISIS positions in northern Iraq (KRG) and northern Syria (Rojava). At the end of December 2015, Human Rights Watch noted that “Kurdish civilians, including women, children and elderly residents, have been killed during security operations and armed clashes since July 2015 in southeastern Turkey. Local human rights groups have recorded well over 100 civilian deaths and multiple injuries. After unprecedented military deployments to the region in recent days, several cities are under curfew and some of their neighborhoods the scenes of shelling by the military and heavy clashes with armed Kurdish groups. The civilian death toll is likely to rise steeply.” The subsequent imposition of curfews and severe military crackdown amounted to a veritable collective punishment of Turkey’s Kurds — disciplinary actions that has also led to the destruction of numerous buildings and monuments or damaged real estate. The area of Sur, home to many structures of historical importance, in the urban centre of Diyarbakır appears particularly affected in this respect. For example, the Kurşunlu Mosque, dating back to the early sixteenth century, is but one of the many architectural victims of the ongoing conflict. The governor’s office even released a public statement indicating that the “terrorists [had] started a fire inside the mosque.” In addition, the mosques of Fatihpasha, Arab Sheikh, Hadji Hamid and Hasırlı as well as the Armenian Catholic and Protestant churches have also become subject to the effects of the fighting, with trenches being dug, barricades set up and explosives put in place. The South-East of the country, mainly inhabited by Kurds, has always lagged behind in terms of economic investment and business opportunities. The PKK has been waging a bloody war against the Turkish state for more than 30 years now. At first, this struggle aimed at the creation of an independent Kurdistan in the south-eastern Anatolia, but in time, these separatist demands have become calls for local autonomy and cultural recognition. The AKP was the first political organization in Turkey to officially acknowledge the existence of a Kurdish issue, and the first one to attempt to tackle the deadlock by means of a negotiation process, known as the ‘Kurdish overture’ launched in 2009. But following the inconclusive June 2015 elections and Turkey’s subsequent November Surprise that saw the AKP receive a veritable mandate for the construction of a post-Kemalist century, Ankara has once again started beating the war drums. Arguably, the AKP leadership seems to have finally come to grips with the fact that the PKK and its leadership have very different ideas about the future of the South-East and Turkey. Whereas, the AKP appears willing “to transform the nation state Turkey into an Anatolian federation of Muslim ethnicities,” the Kurdish faction, on the other hand, envisions quite an alternate reality. The imprisoned PKK leader Abdullah Öcalan, for instance, speaks of a “[d]emocratic confederalism [that] is open towards other political groups and factions. It is flexible, multi-cultural, anti-monopolistic, and consensus-oriented. Ecology and feminism are central pillars.” Given that the AKP and the PKK clearly occupy opposite sides of the political-ideological spectrum, it seems that, at long last, realism has prevailed and now Ankara appears willing to forcibly impose its own socially conservative and economically neoliberal agenda upon the South-East of the country while crushing the PKK and its armed factions. And the ongoing armed conflict seems to present an ideal opportunity to push through the AKP programme of unbridled construction involving cement and granite in addition to unlimited profits for those involved, while arguably ignoring the people on the ground, particularly the about 100,000 inhabitants of the Sur area. In the first week of this month, Turkey’s General Staff announced that a total of about 700 terrorists have been “neutralised” (or rather killed) in the course of the ongoing military operations — operations that were described as “peace and democracy operations” by the Deputy Prime Minister Numan Kurtulmuş speaking on national television (2 February 2016).